During the Plains Indian period, many blades including lance points, trade blades, dag blades, other blades in general were used by the Indians on several different types of weapons. The Native would take the blade and use it for his general purpose. For example, blades that were traded and specifically made for lances were cut down, shortened, re-sharpened and used for knives, hence the lance knife. Other uses that the Native Americans found for these blades were spikes and war clubs (gunstock style, saber style and even ball headed clubs). These Indians shaped these blades in different forms. Most of these blades were made by the Whites and traded to the Indians for furs, horses, buffalo hides, meat or food, etc. This particular lance knife was made from a thin, triangular shaped lance blade hafted to a long osage orange shaft with an iron ferrule, otherwise known as a reinforcement band to keep the handle from splitting when the tang of the lance blade was driven into the handle or shaft. This handle was decorated with 3/8″ brass domed tacks, a favorite of most Plains tribes. 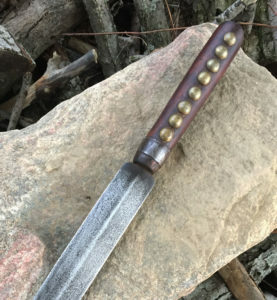 This knife was made to replicate an original that was cut-down from a war lance and retains its saw-marks at the end of the handle, showing it was cut-down from a full-length spear / lance. This blade appears to have original patina from hard use with small pitting and polished file marks. These types of knives were favorite trade items used throughout the Plains by tribes such as Sioux, Cheyenne, Arapaho, Pawnee, Blackfoot, Osage, among others.